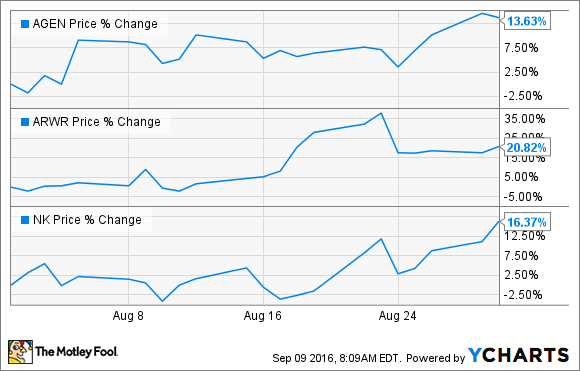 Are These 3 Clinical-Stage Biotechs Still Buys After Soaring in August? Is market sentiment towards biotech shifting? Shares of clinical-stage biotechs Agenus (NASDAQ:AGEN), Arrowhead Pharmaceuticals, Inc. (NASDAQ:ARWR), and NantKwest, Inc. (NASDAQ:NK) all rose by double-digits last month, according to data from S&P Global Market Intelligence. One of the most interesting aspects of this upward trend is that Agenus, Arrowhead, and NantKwest all broke out of the 2016 biotech funk last month without any major clinical or regulatory catalysts. In fact, financial firm Cantor Fitzgerald's upgrade for Arrowhead and Canaccord Genuity's reaffirmation of its "buy" rating on NantKwest were the only outright positive events for these stocks last month, as Arrowhead and NantKwest's quarterly results failed to trigger much of a reaction from the market. Still, analyst ratings rarely spark these types of price moves unless they're coupled to a material event. This suggests something else is afoot. Agenus, Arrowhead, and NantKwest are all arguably at least a few years away from bringing a major product to market -- or even filing a regulatory application, for that matter. Agenus, for instance, is just beginning the long process of evaluating its high-value anti-cancer checkpoint inhibitor platform in the clinic. And Arrowhead's lead RNA interference hepatitis B platform, consisting of ARC-520 and ARC-521, is currently in the early to mid-stage phases of testing, meaning the company will almost certainly remain a cash-flow-negative operation for the foreseeable future. NantKwest, for its part, is on track to release an interim data readout of an ongoing mid-stage study assessing its natural killer cell platform in Merkel cell carcinoma before year's end. But the details regarding the company's commercialization strategy for this key platform aren't altogether clear at this point -- whereas some of NantKwest's peers have laid out a well-defined path forward for investors, making it difficult to handicap this biotech's underlying risk-to-reward ratio. Another key issue to understand is that all three companies ended the most recent quarter with fairly weak cash positions compared to their heavy burn rates. Arrowhead, for example, exited the third quarter with less than $45 million, which isn't exactly confidence-inspiring in light of its burn rate, which topped $19 million in the last quarter. However, the company did raise another $45 million via an at-the-market private offering to help shore up its balance sheet. Agenus and NantKwest aren't in rock-solid financial positions, either, having posted sizable losses in recent quarters. Given these clinical and financial question marks, it's apparent that these three biotechs occupy the high-risk end of the spectrum. Yet the market still saw fit to assign each company an appreciably higher valuation in August, and it did so without any noteworthy shift in their risk-to-reward profiles. Perhaps the key takeaway is that the storm clouds that have been hanging over biotech this year -- and crushing valuations in the process -- might finally be starting to dissipate. If so, these three speculative biotechs might indeed be worth a deeper dive by risk-tolerant investors.